Rockfish populations in Howe Sound do not appear to have rebounded since fishing restrictions and conservation areas were introduced. More research and longer-term data are needed to determine whether protected areas have been correctly placed and will have a lasting impact. Inshore rockfish populations remain low in Howe Sound following severe depletion through the last century. Species such as black, Bocaccio and yelloweye (red snapper) rockfishes saw declines in their populations due to bycatch in salmon sport fishing during the 1960s, a significant issue in the Strait of Georgia and Howe Sound. In fact, many of these rockfish species were considered “trash fish” in sport fishing and were promptly discarded. However, black rockfish were successfully re-introduced in Howe Sound, via transplant in 2005 to one site, and can now be found at two additional sites. Bocaccio rockfish are rarely sighted in Howe Sound, whereas yelloweye rockfish occupy southwestern Howe Sound at low levels. Yelloweye rockfish were previously abundant in the shallow waters of the Strait of Georgia. Further depletion of rockfishes occurred during the 1980s when live market fisheries caused the serial depletion of rockfishes on a reef-by-reef basis — particularly for copper and quillback rockfish. Due to rapidly declining populations, Fisheries and Oceans Canada introduced a Rockfish Conservation Strategy that included the introduction of 164 rockfish conservation areas (RCAs) along the B.C. coast in 2007, 11 of which were designated in Howe Sound (Figure 1). Figure 1. 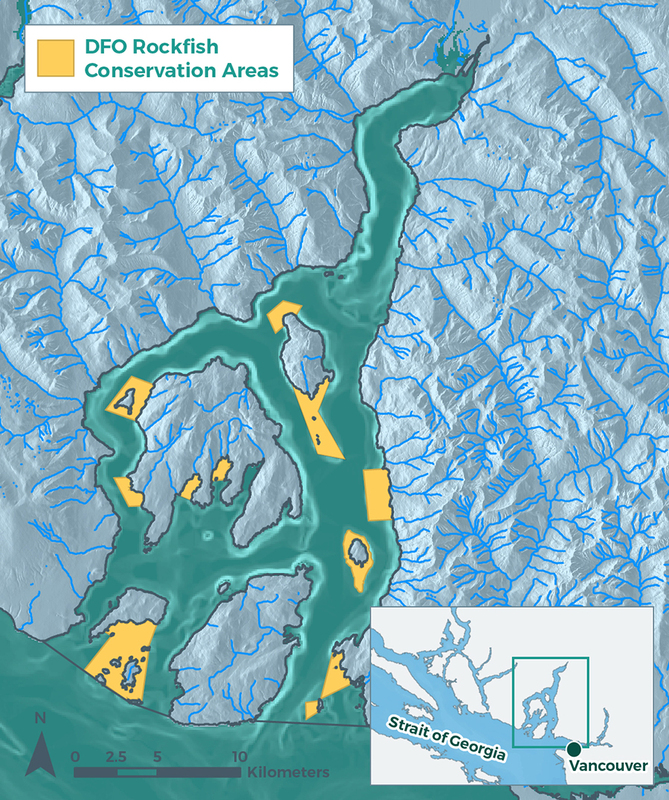 Rockfish Conservation Areas in Howe Sound. British Columbia has 37 species of rockfish; 14 of which have been recorded in Howe Sound during scuba surveys. Out of these 14 species, sightings of some species (blue (deacon), China, splitnose and canary rockfish) have been rare (Figure 2). An additional two species are known to occur in the sound — redstripe rockfish and greenstripe rockfish – but often at depths beyond scuba surveys. Inshore rockfish species such as those found in Howe Sound, occur in highest densities on rocky reefs and complex boulder piles between one and 838 meters deep. The most common species are quillback and copper rockfishes, which can be found in all parts of Howe Sound (Figure 2). Many species of rockfishes are long-lived — some over 100 years — and occupy small home ranges, making them particularly susceptible to over-fishing. Rockfishes fulfill a mid-level predator role in the reef community in the Northeast Pacific. In reef communities, rockfishes eat crustaceans and small fishes and are in turn eaten by lingcod and seals, making them an important link in the food chain. Figure 2. Distribution of rockfish species sightings in Howe Sound since 1967 based on scuba surveys. Some rockfishes live to over 100 years old. Rockfishes are long-lived species and do not reach sexual maturity for decades in some cases. Therefore it will take many years of monitoring to provide conclusive evidence of any trend if there is one. One positive indication of change comes from comparing the size distributions of copper rockfish populations at Whytecliff Park prior to its designation as a no-take protected area in 1993 with more recent data. Unpublished data, from detailed dive surveys in the 1980s with the main focus on Whytecliff Park, provided to the Vancouver Aquarium Marine Science Centre’s Howe Sound Research Group (HSRG), compared to data collected by the HSRG in 2010-2011 show that the fish were smaller in the 1980s (Figure 2). The average size of fish prior to fishing closures was approximately 20 centimeters, still considered a juvenile and thus not sexually mature. 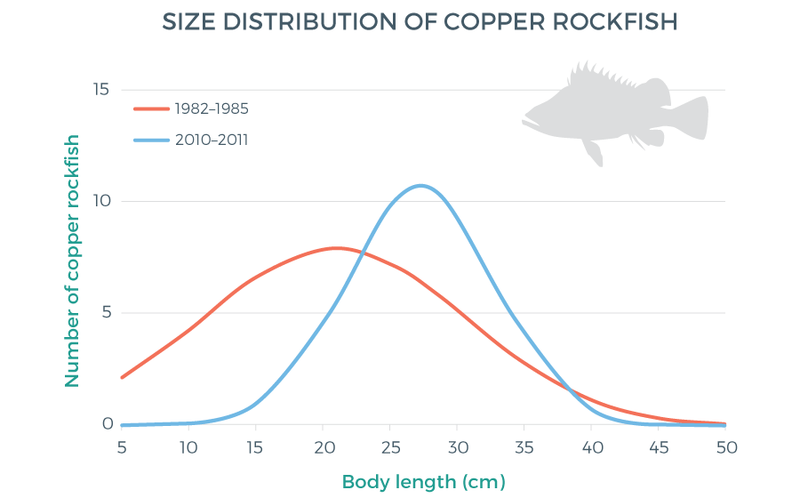 By comparison, the size distribution of copper rockfish at Whytecliff Park 25 years later, and after 17 years without legal fishing pressure, shows larger fish on average, indicative of more sexually mature adults. This size difference is a positive indication of change, as larger rockfish produce more numerous larvae that also exhibit greater survival. Additional data for this comparison (not shown) indicated that overall abundance of copper rockfish was greater in 2010-2011. It is on this length of time scale that we can reasonably assess changes in rockfish abundance and demography. Figure 2. Size distribution of copper rockfish at Whytecliff Park, Howe Sound in 1982-1985 and 2010-2011. Several studies have examined the effectiveness of RCAs in recovery of rockfish populations in Howe Sound and the Strait of Georgia since 2006. Placement of RCAs was initially determined by a habitat model followed by public consultation. 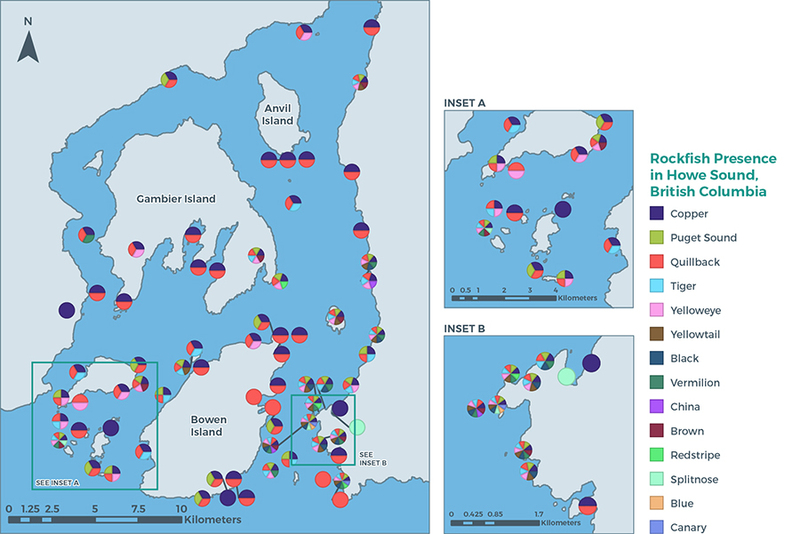 During the establishment of these RCAs, a study examined how rockfish density varied based on habitat at sites inside and outside RCAs in Howe Sound, and found that only the percentage of boulders (high complexity habitat) predicted rockfish abundance. Another study examining effectiveness of RCAs in Howe Sound and other Strait of Georgia regions in 2009-2010 showed similarly that habitat was a key predictor of rockfish abundance and density and also found lower rockfish density in Howe Sound than in Sechelt and the Southern Gulf Islands. Surveys using Remotely Operated Vehicles (ROVs), from 2009 to 2011, of deeper water in 13 RCAs in the Strait of Georgia, including two in Howe Sound, again found that there was no detectable effect of RCAs on rockfish abundance. Each of these studies found that habitat quality was strongly linked to rockfish abundance, more so than the presence of an RCA. This begs the question of whether the RCAs were effectively placed and reinforces the idea that longer time scales are required when studying change in rockfish populations. The Vancouver Aquarium’s annual citizen science rockfish abundance survey conducted along the South Coast of B.C., including Howe Sound, will help to create a long-term dataset that can identify trends in rockfish abundance in Howe Sound. Abide by fishing regulation which has all of Area 28, which includes Howe Sound, closed to hook-and-line jigging for groundfish. Report illegal fishing activities to DFO 604-666-3500 (1-800-465-4336). Support the annual rockfish abundance survey by spreading awareness and contributing dive surveys to the Vancouver Aquarium. Commit more resources to monitoring rockfish populations in RCAs with suitable habitat. Commit more resources to monitoring and enforcing compliance with fishing regulations in RCAs. Simplify regulations in the RCAs. Increase public education and awareness of closures to commercial and recreational fisheries, and the status of rockfish populations.